Library cats are a popular sight in public libraries across the US and around the world. The majority of library patrons seem to be in favor of the feline bookworms. Not everyone is always happy about their presence, however, often citing allergies as a problem. Even so, the number of cats doing book duty has risen over the last 25 years. Despite some protesters, many libraries have taken on cats, sometimes more than one. Those with cat allergies are left to deal with them on their own. In the video above, we meet the library cats of the Ocean Shores, Washington, library: Olivia, the older of the two and the more mellow black cat, and Waldo, the younger, more active tabby kitty. Iron Frog Productions has set up a map showing the locations of many of these cats worldwide, including current and former resident cats. I'll mention just a few choice ones here. Nyx the blind library cat is at the Chesterfield County Public Library in Virginia. Nyx was born with no eyes and had surgery to sew her eye sockets shut. She navigates by echolocation, and seems to be doing well. Like all cats who live in libraries, she is obviously spoiled. 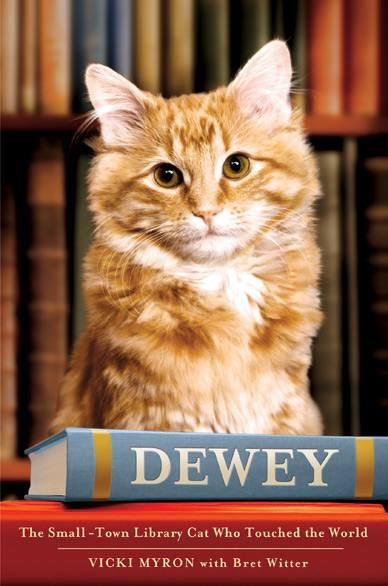 The most famous kitty to dwell in the den of the books is probably Dewey Readmore Books, of Spencer, IA. Dewey's fame reached worldwide status, and condolences came from all over the world when he died in 2006. His obituary appeared in hundreds of newspapers. by Vicki Myron, made the New York Times best-seller list and is being made into a movie with Meryl Streep (more cat books). Vicki has a new feline friend now, named Page Turner. Originally, Page Turner was reported as female, but turned out to be male. Page is not a library kitty, but Vicki's own cat. Like Dewey, Page was a stray, and is a tabby and also resembles Dewey quite a bit. In Florida, at the Umatilla library is another library cat named Dewey. Unlike the Spencer library's cat, however, Dewey Decimal is a female. Her human could no longer take care of her, so now she spends her days surrounded by books, typing and using the phone. There's also another cat named Page Turner at Umatilla. Their page on their resident cats seems to be down or missing, so I've linked to their home page.